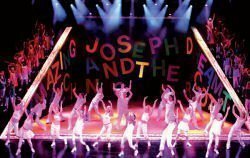 Joseph and the Amazing Technicolour Dreamcoat – Re-imagined! Joseph is back in London at last! This musical really is a proper musical, told in song from end to end like an opera. It's a show that features only a few rare moments of actual spoken dialogue. The plot is family-friendly and the music will probably feel familiar even if you haven't consciously heard it before. According to the Really Useful Group, the owner of the copyright, by 2008 more than 20,000 schools and amateur theatre groups had produced the musical, all over the world. Based on the story of Joseph's coat of many colours from the Book of Genesis, these days Joseph and the Amazing Technicolour Dreamcoat is a genuine icon of a show. So what's the story? The Narrator reveals a popular bible legend that follows the lives of Jacob’s favourite son, Joseph, and his eleven brothers. When Joseph's brothers sell him into slavery he makes friends with the Egyptian nobleman Potiphar. But he refuses to sleep with Potiphar's wife and gets thrown into jail. While he's there, Joseph realises for the first time that he can actually interpret dreams. The Pharaoh, a troubled character, hears about the young man's unusual talent and brings Joseph in to try to resolve Egypt’s terrifying famine. Having become the Pharaoh’s trusted right hand man, Joseph is ultimately reunited with his family. This is a brand new production created in celebration of the show's 50th anniversary, and it's on at the London Palladium in the summer of 2019 for a strictly limited season. Joseph has a sparkling history. It enjoyed its professional premiere at the Edinburgh International Festival in 1972, produced by the Young Vic Theatre Company. By 1973 it had hit the West End, and it enjoyed a long run of regular West End and Broadway revivals in the years to follow. 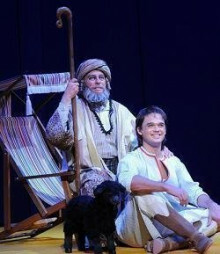 A direct-to-video film of the show was created in 1999, starring Donny Osmond as Joseph. 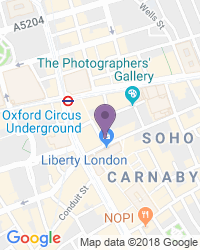 And the last West End revival was in 2007, running for two years. In 2016 Bill Kenwright directed a touring production starring Joe McElderry, making this latest revival a long-awaited treat for the capital. The show is stuffed with brilliant show tunes including Close Every Door, Benjamin Calypso and the infamous Any Dream Will Do. The highly prestigious role of Joseph has been played by Lee Mead, Jason Donovan, Joe McElderry, Gareth Gates, Phillip Schofield, Darren Day, Stephen Gately, Ian Watkins, Lloyd Daniels and many more. It has been presented to audiences tens of thousands of times across the world, and has attracted multiple major awards and nominations. This show is recommended for people of any age, a family-friendly show that everyone can understand and enjoy. But it's probably best for those aged five and over. 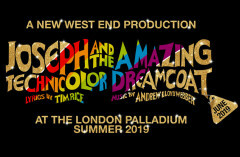 It’s been announced that Tim Rice and Andrew Lloyd Webber’s first and most loveable musical JOSEPH AND AND THE AMAZING TECHNICOLOUR DREAMCOAT will return to the London Palladium next summer where it enjoyed a long and successful revival in the 1980s. Few other details have been released yet so while we await news of casting and creatives here’s a Lloyd Webber quiz, just for fun. Use the search box at the top left of this page to search for Joseph and the Amazing Technicolor Dreamcoat tickets availability.